It’s long since we last got in touch with you all, and, because we missed you we’re back with new subjects and knowledge, which we want to share. Throughout the last few years, I usually had some kind of checklist/spreadsheet with testing job interview questions and ideas. 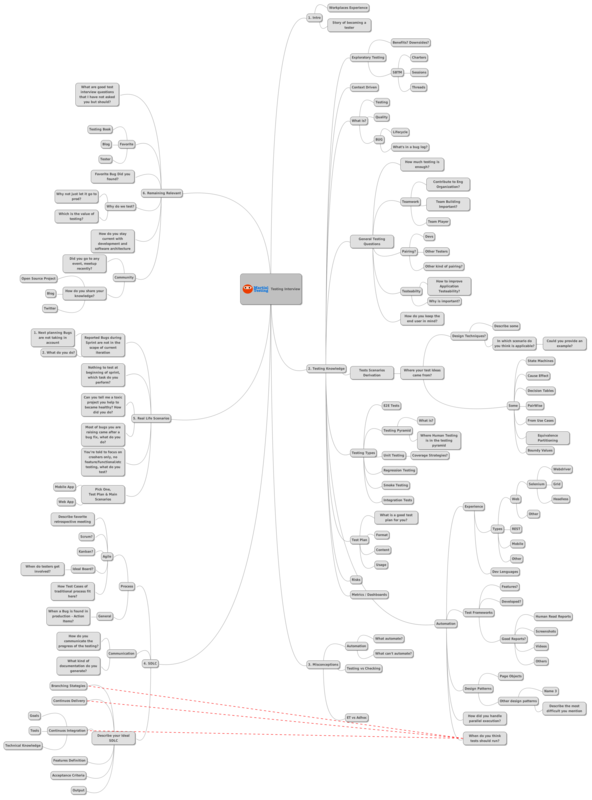 Ever since that time, I had in mind creating an easy to navigate mindmap to go through during the interviewing process while taking notes. Hello! How is it going? Today I’d like sharing some awesome news. As you can see by the post’s title as well as the picture, we have begun working collaboratively with other like-minded professionals towards the making of TestingAR Meetup. It all comes about as the initiative of a group of passionate people who are keen on making a difference, as well as on promoting the creation of a solid community with a meeting place. Its purpose will rely upon bringing together the community more regularly so that we can share our experiences, success stories, lessons learned, tools employed, methodologies and good practices, among other topics. Furthermore, having a place where we can meet, discuss topics, and grow together will also help in building confidence, as well as strengthening bonds among participants. Nowadays, we are aiming at holding our very first meetup on February 2016, the date has not been set yet, though it will be available soon. It will be a moment for exchange, so stay tuned for more information. Last, yet not least!! It will also be the perfect excuse to get together and meet in the flesh with other colleagues, and share some good talks in a relaxed environment. Wow, once again it sure has been quite a long time since we last shared something with the community, and what better day to make a comeback than today? For those of you who may not know, today it is September, Tuesday the 9th, and that means we are celebrating the International Day of the Software Tester, so if you are engaged in this awesome craft… cheers for you! It dates back to 1947, whilst the team in charge of working on the Mark II computer, which would come as the successor to the ASCC Mark I, shared their discovery of what would become the first report of an error caused by a bug, and in that case, an actual bug. Apparently, the supercomputer had a problem in an electromagnetic relay, and when the problem was investigated, the team came across that the problem was being caused by a moth, its presence in the supercomputer was causing the relay to stay open. One of the team members, Grace Murray Hopper, Degree in Physics and Mathematics, came across with the moth, and thereafter “reported it” (so to speak) by sticking it with tape on a log referring to it as “bug” to describe the cause of the problem. On the other hand, if we go to another time in history, we can find that Thomas Alva Edison had used the term “bug” in some of his notes on interference and malfunction. However, it is Grace Murray Hopper who is known as having associated the term for the first time with computers, and having written in the log “First actual case of bug being found”. Whatever the case, it was our intent wishing all of our colleagues a very happy day!